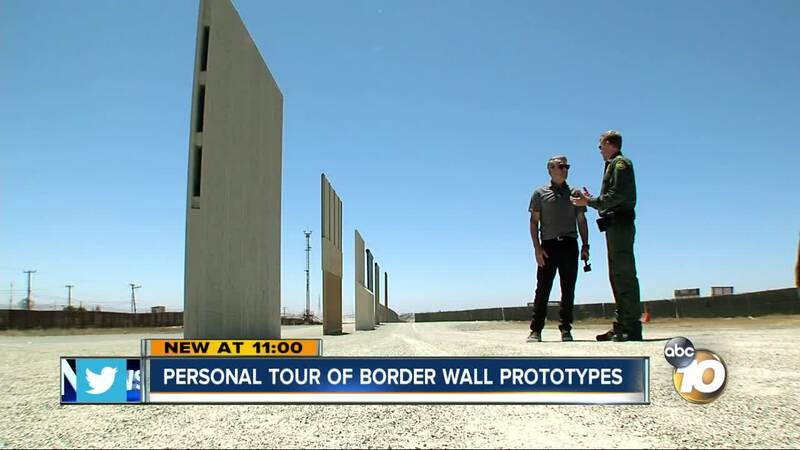 SAN DIEGO (KGTV) - This week 10News Anchor Steve Atkinson was given a personal tour by Border Patrol Chief Rodney Scott who is responsible for 60 miles of international border with Mexico in the San Diego sector. Part of that tour included a visit to inspect up close and personal the new border wall prototypes. Standing beneath them, there is only one word fit to describe the prototypes, imposing. The eight structures are 30 feet tall, most made of thick concrete. "This was the first time ever that we brought in industry," said Chief Rodney Scott. And while the prototypes were bid out and made by the construction industry, much of the input for their design came from Border Agents who've had decades of experience of what works, and what doesn't. "I got more input than most,” said Chief Scott. “I got to show the President the prototypes and explain to him based on my experience what we needed." It was Chief Rodney Scott who was tasked with giving President Trump a personal tour of the border wall prototypes back in March. And, it was his input and agreed to by the President that the wall should be see through. That perspective allows the Border Patrol to see who's on the other side, and who might cause a threat. Each one was then systematically tested by Border Patrol Agents themselves. "I was able to explain to him that our guys were able to defeat this one in this amount of time using these techniques, this one was harder, this one was not, this one allows people to hide behind it, this one does not," said Scott. Ultimately, there will be no one winning design. The terrain along the 2000 miles of border with Mexico is vastly different as well as the climate. So, the environment will determine the type of wall or a combination of walls. "There was never an intent to pick one and copy that along the entire U.S. border. The entire concept literally was how can we do this better," said Scott. "But we're not picking one of these walls over the other walls, and we never planned on doing that. So, depending on the terrain or the environment, it could be any one of these? Correct."